Although it was not as warm today as yesterday, I took some of my plants outside to start hardening them off and get them under some natural light. 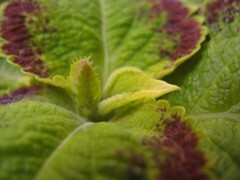 I noticed that one of the Coleus that I just received (Coleus ‘Japanese Giant’) is already starting to bloom. Something tells me that I’ll have to keep a watchful eye on this plant so it doesn’t flower until the end of the season. I took cuttings from Forsythia branches that one of my coworker had, dipped the cuts in rooting hormone, and placed it in 50/50 potting soil & perlite. 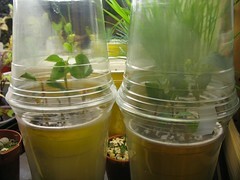 I then used clear drinking cups to act as mini greenhouses. Hopefully in a few year, I’ll have blooms like this. This entry was posted in Uncategorized and tagged coleus, coleus japanese giant, cuttings, forsythia. Bookmark the permalink.